you wil.l know that the chosen card was the 9H. One of the few methods in Mentalism that fulfills all requirements for a sound all-around practical mental effect for all occasions. 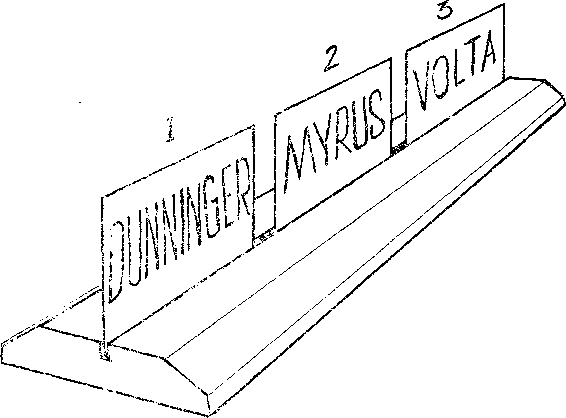 The Effect: Three members of the audience step forward and each select a famous mentalist name and an ESP symbol. The performer then immediately derives the name and symbol that each member is concentrating on. It is with great pleasure that I am releasing this effect to the mental profession. It represents many months of work that I have spent to perfect it to the Nth degree. Once the basic method is mastered its possibilities are unlimited. Notice that I have said method, for there are no sleights or moves to be mastered, and there are no gimmicks or special' equipment needed. All that is needed is the method and proper showmanship. With this combination you have an effect that will leave your audience spellbound. I have been using DUAL THOUGHT in my act for several years, and have had many offers from other mentalists for the method used in this effect. With the method you are prepared to give a demonstration at any time and under any conditions. It is ideal for demonstrations at newspaper offices or for any spur of the moment occasion. For close-up and taole work it is perfect, and is great for platform and stage use. Gua>*d and use this method well, and you will have an effect that will always uphold your reputation as a Master Mentalist. Before revealing the method to you I would like to say a few words about showmanship, This is one of the great weaknesses of amy who enter the field of mentalism. Without the proper showmanship and patter a mental effect just becomes another trick. I have seen many a good effect fail due to the lack of proper presentation. I would suggest that if you are considering entering this field of work as a profession that you witness several of the shows of some of the leading men. I would also encourage you to read several of the books and manuscripts by Burling "Volta" Hull, who in my opinion is a master in this field. All of his works have many good pointers in the proper methods of showmanship and the proper method of mental presentation. For the occasional performer I would suggest that you use the 'lecture' type performance. For the "'Question and Answer" "-ype show, this takes much more practice and showmanship. The brief outline of patter and presentation I have outlined in DUAL THOUGHT will fit in well with the lecture type presentation. But above all, give much thought to this subject of showmanship and mental presentation, for it will pay big dividends in all types of mental acts. Properly presented this effect always leads up to a smashing climax and leaves you with a bewildered audience. I have been asked many times to repeat this effect for a small group at their table after my main show, and this is one effect that can fill that request over and over. 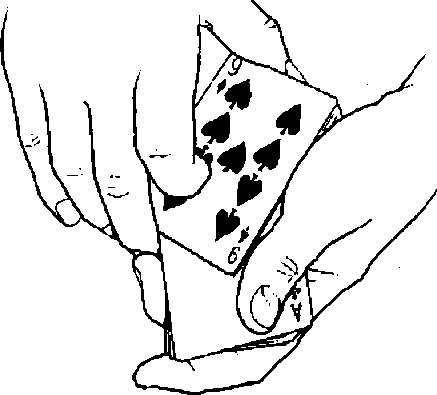 Now to give you the method for this baffling act First I will draw diagrams of the various cards used in this act, and give you the reference names and numbers of them so you can follow the instructions with no trouble.